American Heart Association Heartsaver CPR AED is a classroom, video-based, instructor-led course that teaches adult CPR and AED use, as well as how to relieve choking on an adult. This course teaches skills with AHA's research-proven Practice-While-Watching (PWW) technique, which allows instructors to observe the students, provide feedback and guide the students' learning of skills. Course comes with online manual, No Book will be provided, you may purchase a Heartsaver book for an additional $20 dollars. 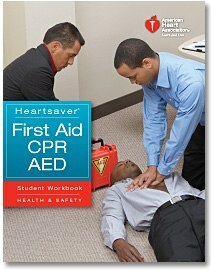 Note: The American Heart Association HeartSaver CPR AED Course is not recommended for people in or entering the medical profession (MD, DO, PA, Nurse, Paramedic, EMT, Students, etc.) 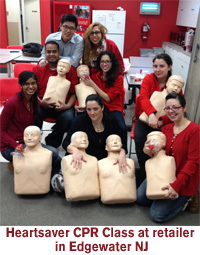 Please see BLS for Healthcare Provider Course. Optional First Aid, including treating bleeding, sprains, broken bones, shock and first aid basics. There is no written exam, Students must pass a skills test in order to qualify for an American Heart Association Heartsaver Course Completion Card. Course length depends on optional modules selected.